SBP Software is realeasing a new online prenatal screening software targered to small labs and doctors. The software is a web application hosted on the cloud, accesible for mobiles, tablets or desktop computers that allows the calculation of 1T, 2T and Preeclampsia screenings. 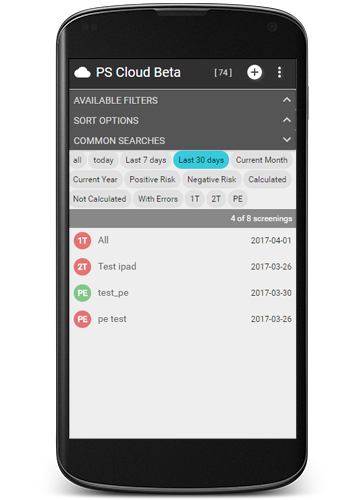 Please, create an account on Prenatal Screening cloud and you will recive few screenings for free to check and test the software. Contact to support-psc@sbpsoftware.com for any doubt or problem you may have. Trisomy Risk Calculator is no longer available. Please, use http://www.prenatalscreeningcloud.com/ instead. Menu Web SBP SOFT 2007 S.L. The products SsdwLab 5 and SsdwLab 6 from SBP Soft 2007 S.L. company have been certified with the EC Full Quality Aassurance System by the NB 0318. The SBP Soft 2007 S.L. company has established and applies a quality management system according to the standard UNE-EN ISO 13485. Website of the new version of SsdwLab prenatal screening software. New user interface redesigned for web-browser access, multicentre and multi-user environments and incorporating many improvements and new features.